Blerim Kasneci once wrote “I am old sorrow and past predicament/Now, without identity in a street nameless to me, I am a stranger/I am longings, I am fears.” Kasneci’s poetry in exile reflects in Sridhar, a character in The Garden of Solitude written by debut novelist Siddhartha Gigoo. Gigoo, who hails from India’s northern most part of Kashmir, met exodus in 1990 along with half a million Kashmiri Pandits, an ethnic minority in the region. The novel which released early this year has conquered among the top three in fiction charts across India. 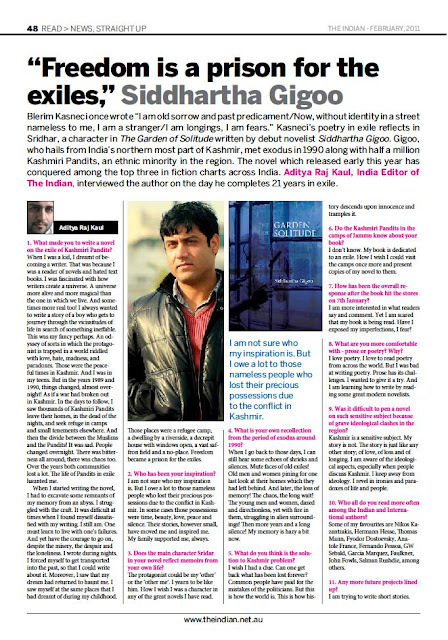 Aditya Raj Kaul, India Editor, The Indian, Australia interviewed the author on the day he completes 21 years in exile. 1. What made you to write a novel on the exile of Kashmiri Pandits? When I was a kid, I dreamt of becoming a writer. That was because I was a reader of novels and hated text books. I was fascinated with how writers create a universe. A universe more alive and more magical than the one in which we live. And sometimes more real too! I always wanted to write a story of a boy who gets to journey through the vicissitudes of life in search of something ineffable. This was my fancy perhaps. An odyssey of sorts in which the protagonist is trapped in a world riddled with love, hate, madness, and paradoxes. Those were the peaceful times in Kashmir. And I was in my teens. But in the years 1989 and 1990, things changed; almost overnight! As if a war had broken out in Kashmir. In the days to follow, I saw thousands of Kashmiri Pandits leave their homes, in the dead of the nights, and seek refuge in camps and small tenements elsewhere. And then the divide between the Muslims and the Pandits! It was sad. People changed overnight. There was bitterness all around; there was chaos too. Over the years both communities lost a lot. The life of Pandits in exile haunted me. When I started writing the novel, I had to excavate some remnants of my memory from an abyss. I struggled with the craft. It was difficult at times when I found myself dissatisfied with my writing. I still am. One must learn to live with one's failures. And yet have the courage to go on, despite the misery, the despair and the loneliness. I wrote during nights. I forced myself to get transported into the past, so that I could write about it. Moreover, I saw that my dream had returned to haunt me. I saw myself at the same places that I had dreamt of during my childhood. Those places were a refugee camp, a dwelling by a riverside, a decrepit house with windows open, a vast saffron field and a no-place. Freedom became a prison for the exiles. 2. Who has been your inspiration? I am not sure who my inspiration is. But I owe a lot to those nameless people who lost their precious possessions due to the conflict in Kashmir. In some cases those possessions were time, beauty, love, peace and silence. Their stories, however small, have moved me and inspired me. My family supported me, always. 3. Does the main character Sridar in your novel reflect memoirs from your own life? The protagonist could be my 'other' or the 'other me'. I yearn to be like him. How I wish I was a character in any of the great novels I have read. 4. What is your own recollection from the period of exodus around 1990? When I go back to those days, I can still hear some echoes of shrieks and silences. Mute faces of old exiles! Old men and women pining for one last look at their homes which they had left behind. And later, the loss of memory! The chaos, the long wait! The young men and women, dazed and directionless, yet with fire in them, struggling in alien surroundings! Then more years and a long silence! My memory is hazy a bit now. 5. What do you think is the solution to Kashmir problem? I wish I had a clue. Can one get back what has been lost forever? Common people have paid for the mistakes of the politicians. But this is how the world is. This is how history descends upon innocence and tramples it. 6. Do the Kashmiri Pandits in the camps of Jammu know about your book? I don't know. My book is dedicated to an exile. How I wish I could visit the camps once more and present copies of my novel to them. 7. How has been the overall response after the book hit the stores on 7th January? I am more interested in what readers say and comment. Yet I am scared that my book is being read. Have I exposed my imperfections, I fear? 8. What are you more comfortable with - prose or poetry? Why? I love poetry. I love to read poetry from across the world. But I was bad at writing poetry. Prose has its challenges. I wanted to give it a try. And I am learning how to write by reading some great modern novelists. 9. Was it difficult to pen a novel on such sensitive subject because of grave ideological clashes in the region? Kashmir is a sensitive subject. My story is not. The story is just like any other story; of love, of loss and of longing. I am aware of the ideological aspects, especially when people discuss Kashmir. I keep away from ideology. I revel in ironies and paradoxes of life and people. 10. Who all do you read more often among the Indian and International authors? Some of my favourites are Nikos Kazantzakis, Hermann Hesse, Thomas Mann, Fyodor Dostoevsky, Anatole France, Fernando Pessoa, GW Sebald, Garcia Marquez, Faulkner, John Fowls, Salman Rushdie, among others. 11. Any more future projects lined up? I am trying to write short stories. I'd like to wish Mr. Siddhartha Gigoo lots of good wishes and thank him for writing on this subject. And Congratulations to you for a good and neutral interview. good one !! I am now days reading about kashmiri pundits and the issues prevailing since years. and would like to wish Mr. Siddhartha Gigoo good luck and best wishes ! !